My first trip to Calgary and I liked the city. It's hilly with views of the Rockies and has a big city feel which Edmonton doesn't. 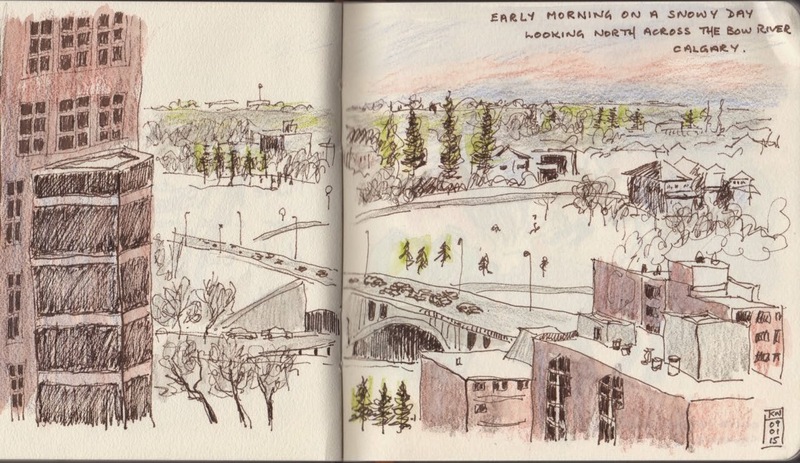 Early morning sketch looking north across the Bow River from the International Hotel. The Fourth Avenue Bar at the International Hotel served excellent (though expensive) fish and chips. The chips were spicy hot! Must have been their Chef Naidu's specialty. (Due to the presence of the Downtown Airport in Edmonton, there was a restriction to the height of buildings in the city. It's only now, many years since the closure of that airport and the demise of any plans to revive it, that taller buildings are beginning to appear on the Edmonton skyline).